The importance of making the most out of the city’s waterfronts has come into currency in recent years. From the Rebuild by Design project as a response to the devastation caused by Hurricane Sandy, to exhibitions here in Copenhagen on water and the city (see DAC, ‘The Rain is Coming’) it is widely recognised that thinking and designing with water represents a great opportunity to make cities both resilient and attractive. 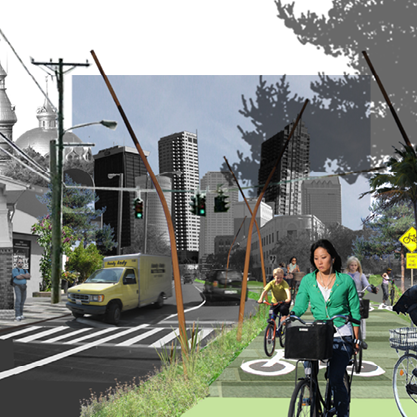 In 2012, arki_lab entered a international design competition for rethinking, or re ‘stitching’, the city of Tampa, Florida. The competition brief called for proposals that would design a new urban framework, bringing it around from a car-dominated, fragmented and inactive city centre, hinging on reconnecting the river and the city. Our proposal put forward a multi-phased, holistic masterplan for the city that would at first activate the riverfront as an amenity for the public, turning it into a cultural spine and leisure facility, and therefore bringing public life back to the centre. The second phase involved developing a network of canals from the river into the city, in this way extending the water into the built environment and providing further opportunities for recreation. For the project we worked with a water engineer who worked out that via a ‘Chimney effect’, energy could be captured from the canals and utilised as a highly sustainable resource. The third phase looked at growing a green network of routes through the city, establishing pedestrian and cycle friendly connections from the suburbs to the centre and so bringing a more active, lively and social experience to the streets while integrating the city. Finally, the fourth phase considered the buildings, or in fact the lack of them as Tampa had so many empty plots! These presented a blank template in which we envisaged an interesting and varied cityscape through the use of different architects, incorporating sustainable and attractive elements such as bioswales and green roofs. The standard of entry was high, with firms from Hong Kong to Berlin competing, and so we were delighted when our submission was selected as an Honourable Mention, alongside the competition winners. A book is on the way, which will present the winning ideas, as well as essays from the panel, scholars and stakeholders. It will be a great way to display the work of arki_lab and the other talented firms. We will let you know when it lands on our coffee table!